Magical is the first word that comes to mind when I think of Stardust, shortly followed by fantastical and wonderful. This is the ultimate fairy tale. I think adaptation of fairy tales, fantasy and science fiction movies tend to go one of two ways: really great, or not so enjoyable. The really great have a good plot and engaging characters, and an appropriate amount of well done effects, whereas the bad might have poor special effects, rely too much on them and not enough on dialogue and substance, or just not have good storylines. Stardust is definitely former. This film doesn’t hesitate to get straight down to the action and plot of the story, offering a lovely blend of action, adventure and romance. The two things I enjoyed most when I read Stardust were Gaiman’s beautiful writing and the intricacy and detail of the story. What’s nice is that there’s a voiceover narration throughout parts of the film, so viewers don’t lose the magic of Gaiman’s storytelling. The plot is also loyal, for the most part, as far as I can remember, which is normally not a huge consideration for me, but I loved how intricate Gaiman wove the plots of his novel. I can see where some people might not like Tristan. At first he makes himself a bit of a doormat, but I promise he grows more likeable if you keep watching. I have to say that this is one film where I really enjoy the special effects. What’s there is done well is appealing, but there’s not so much of it that one is overwhelmed. I particularly like them in the scenes with the three sisters/witches. I also love how they’ve brought the sky vessel to life here. I had a hard time envisioning it as I read, but I liked how it was ultimately portrayed. I first rented a copy of this DVD for Netflix, and as soon as it ended I knew right away that I wanted it for my own collection. 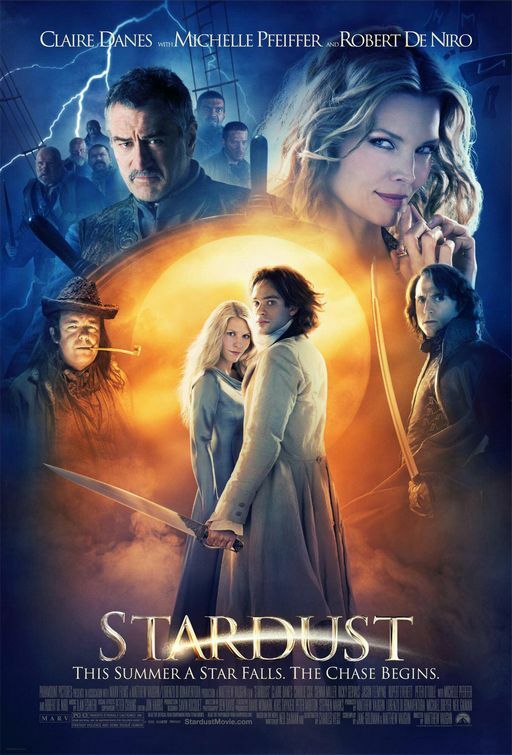 Stardust is a great way to get a dose of fantasy and fairy tales in two hours. I would say this movie does one of my favorite novels the justice I believe it deserves. I got the photo I've used in this post here. I love, love, LOVE both this book and movie! I also bought a copy almost immediately after seeing it, and I show it to as many friends as I can. I think it's interesting you think it followed the plot loyally. I thought so too, until I went back and read the book again and was surprised at the amount of changes! But, I think we feel it is true to the story, because it is true to the nature or message of the story, and that's just as important as following the plot. Thanks for the great review and spreading the word about a great book/movie! Even though I think of myself as a Gaiman fan, I have not read this book (yet!) It is on my bookshelf, however. Plus, I didn't know that it was a movie. How cool is that?! Now I'm for sure gonna have to check it out. Stardust was the very first Gaiman novel I ever read. So seeing the movie was a must. We own the DVD too and have watched it many many times. We also own the book.